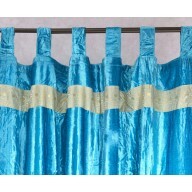 Our vibrant trimmed curtains are made with an embroidered sari border on the top and bottom, and adjustable tie tops. The fabric is a poly blend for color fastness and durability. Our signature Indian Sari Curtains are made from an entire sari, the traditional Indian dress. They feature embroidered trim on both sides and adjustable tie tops. Panels sold individually. Designed, Produced and Imported into the US by Worldcraft Industries. The Indian Sari Curtain Panels are made from an embroidered sari, the traditional clothing of India, with an intricate border and adjustable tie tops. 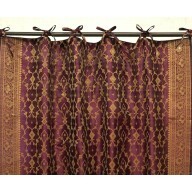 The Velvet Curtain Panels are made from rich velvets with embroidered trim and thick loop tops for hanging. They are completely hand made and feature a coordinating intricate border on the top and bottom. Designed and Produced by Worldcraft Industries in Rajasthan, India and imported into the USA. Worldcraft’s unique line of Indian style Curtains are designed to add palatial charm and beauty to your home environment. 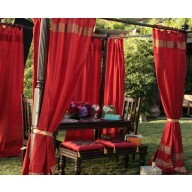 The Embroidered Trim Curtains are stitched from vibrant fabrics with rich textures and bordered with sari trims. The curtains feature adjustable tie tops and a blended fabric composition to ensure color fastness and durability. 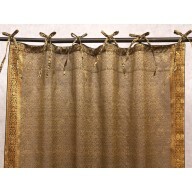 The Sari Curtains are fashioned from an entire sari, the traditional dress of India. The velvet curtains feature lush fabrics, hand selected and paired with embroidered trims from the bazaars in Central Delhi. Drape the decadent Velvet Curtains on thick loop tops to create your own luxurious sanctuary.